I read this article and found it very interesting, thought it might be something for you. The article is called 8 Ways to Save on Home Appliances and is located at https://electrify.sg/content/articles/8-ways-to-save-on-home-appliances/. Home appliances, such as refrigerators, air conditioners, and washers are mostly big-ticket but essential to every home. Fortunately, there are ways to ensure you don’t spend more than you have to, especially in the long-run. Appliances that cost more are not necessarily better for you. You are usually paying extra for additional features. For example, some ovens cost a few hundred to a few thousand dollars more because they heat up to higher temperatures and have extra cooking modes and automatic programmes. Unless you need those bells and whistles, go for a cheaper model. If you take the time to think about what you really need, it will help you make wiser decisions on what to buy. If you don’t host large dinner parties at your home and only cook for two most of the time, then a smaller oven or even a table-top one would be good enough. What’s more, a smaller model is much more space efficient! Table-top ovens are also great for quick and fuss-free reheating so you can skip having a microwave. Purchase a refrigerator that is sufficient for your family size. 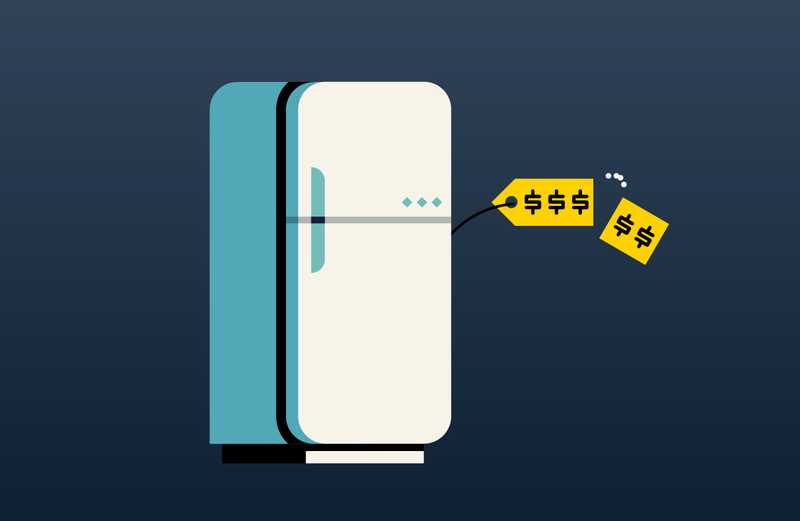 Buying a bigger refrigerator than you need costs more upfront and in the long-run (consumes more energy). Appliances cost money even after buying them. They consume electricity and some require parts to be replaced regularly. Vacuum cleaners that use disposable bags are good for homes with pets and people who cannot tolerate dust. They are also easy to dispose of. However, those bags cost a few dollars each. Hence, it’s more economical to use bagless vacuum cleaners instead. Another long-term cost to consider is energy consumption. Choose energy-efficient models whenever it makes sense. Front load washing machines require up to a third less water, energy, and detergent. They are also gentler on clothes. The only issues are that they are usually more expensive upfront compared to top loading machines and are not so ergonomic for loading. A multi-door refrigerator saves energy as less cool air escapes when you open just one door. Some refrigerators also have an outer door for frequently used items like drinks and condiments, reducing the amount of cool air that escapes. When buying appliances, do your homework and ask around for prices of your preferred model. Besides giving discounts, most retailers will do a price match if you tell them that you can get it cheaper elsewhere. Some appliances are very good but expensive. If you don’t mind, ask the salesperson whether they are selling any display sets. Another hack is to look out for roadshows and popups. Some of them will allow you to buy display and test sets (that are only opened and used for the duration of the event) at a big discount. What’s more, you still get the full warranty. The only catch is that you can only collect the item on the last day of the event. Save on home appliances with the help of sales. Most appliances can be bought at a discount if you are willing to wait for sales at department stores (which happen very frequently) or sales during the holidays. It pays to be patient! Some retailers offer extended warranties for appliances like air conditioners and washing machines for at least a hundred dollars. Extended warranties are a great money-making avenue for retailers as most consumers don’t end up claiming it. According to Consumer Reports, the manufacturer’s warranty is good enough most of the time. All information provided in this article is strictly for general information purpose only. BankBazaar and Electrify do not provide any warranty about the authenticity and accuracy of such information. BankBazaar and Electrify will not be held responsible for any loss and/or damage that arises or is incurred by use of such information. For more details, please consult your financial adviser.